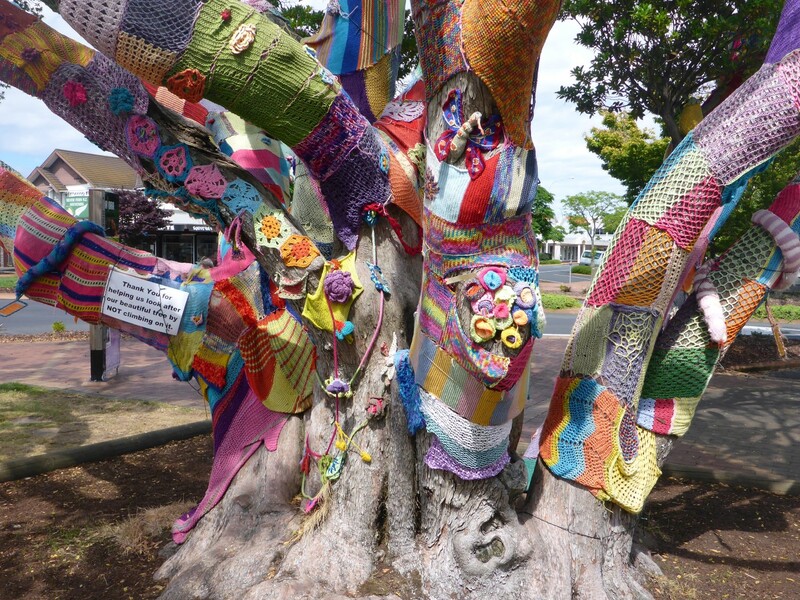 Auckland, North Island, NZ. 22nd December 2014. New Zealand has a State Highway system, with the numbers written on shields, rather like the US. SH1 is the ‘Mother Road’ in that it runs the whole length of NZ, north to south. Not quite in one fell swoop, there being a small matter of some water to cross between the two islands. Leaving Auckland to head north took me onto the cross city motorway and eventually on to a tolled section. ‘Pay Online’ is the advice given by the signs. There are no toll booths although it is possible to stop in a service area and pay cash into a machine. This incurs a charge on top of the toll so I didn’t bother. When I later checked online to see what I owed my registration number got no response. I didn’t ask twice. Once I’d left the motorway behind the road became single carriageway with passing lanes on the hills. The speed limit is only 100kph and I was pleased to see that Kiwi drivers seem to be quite well behaved. My typical riding speed is about 90kph and this suited the road conditions well. I had a pleasant ride up to Pukenui, a small town in Northland, which is the prosaic name given to the northern part of the north island. I had booked a hostel bed there, which turned out to be in a shared room in a late 19th C wooden building. It was sited next to the sea. The terrain I rode through was quite varied although low key. Cattle farming and logging in the main. There was a big milk processing plant too. Where were all the sheep that NZ is so famous for? One thing for sure is that the countryside is very green and I saw plenty of the small, rolling hills of the type that could be seen in Hobbiton. The trees were a mixture of those that were familiar from Britain and those that definitely weren’t, confirming NZ’s reputation as a place that was comfortingly similar to home and yet excitingly different too. A good trick if you can pull it off. 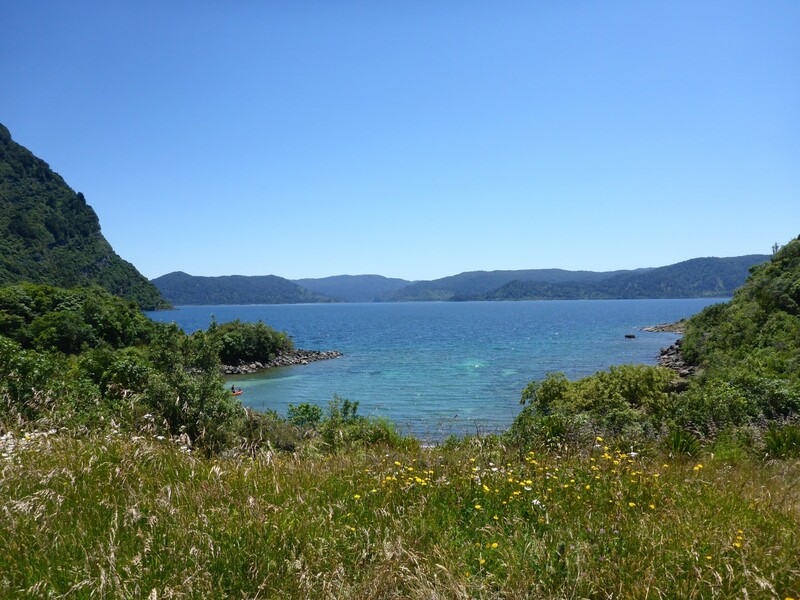 A diversion off the main road down to the coast at the Bay of Islands had also revealed some of the beauty that lay in wait for me in this naturally diverse country. New Zealand in its current incarnation was formed from volcanic action coupled with the effects of subduction as the Pacific plate pushes its way under the Indo-Australian plate, giving rise (pun intended) to the Southern Alps. It used to be part of Australia until the two countries were pushed apart. The result is that the North Island is mostly volcanic and this shows in the nature of the land and its shape. Rolling hills, sometimes steep but not high, appear in front of me as I ride north, looking like round pyramids, row behind row behind row. The islands around the coast all came from volcanic action too. The warm and often wet climate in Northland encourages sub tropical plants which are green and lush. Although the climate is generally temperate, New Zealand has many micro climates meaning that variety is plentiful. Terrific place to build a hostel. Having settled in to the hostel I went for a ride up to Cape Reinga, NZ’s most northerly point. 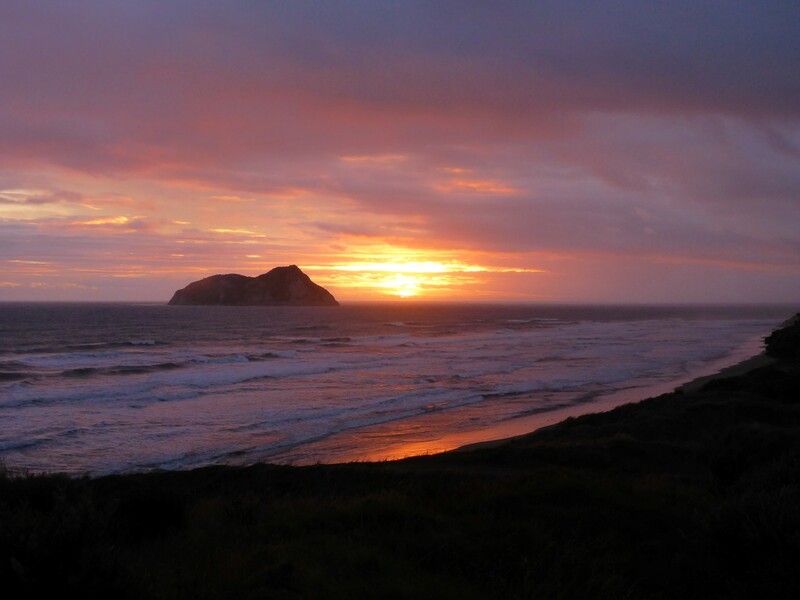 It is from here that the Maori believe the spirits of the dead head out across the sea on their journey back to the Homeland of Hawaiki, from where they believe they originated. The Europeans took a more practical approach and marked it with a lighthouse. Leaving there I took the road that went out to some giant sand dunes, where people could have fun with their sand boards. 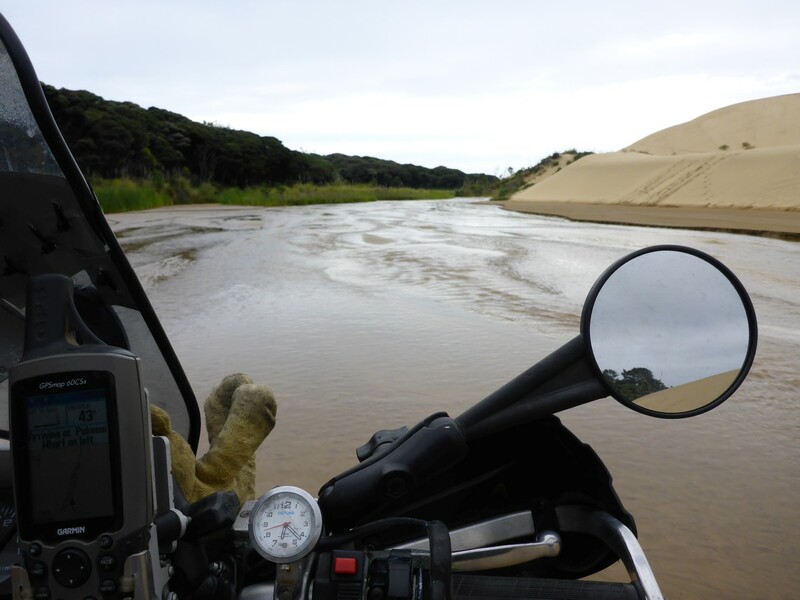 Riding past this took me across a ford and then along a sandy stream bed for about 3kms until I was able to turn south onto Ninety Mile Beach. Yes, a beach that was ninety miles long! I discovered later that this is a misnomer and the beach is really only sixty miles. Still worth an exclamation mark though. The incorrect name came about when the early settlers determined its length by how long it took to walk along it, a common way of measuring in those days. They forgot that walking in sand takes much longer than normal terrain, hence the overestimation. For my part I just aimed the bike down the damp beach, between the sand dunes and the sea, and blasted it. Fifty kilometres later I reached a point where I could get off it, still only half way along. Great fun! Then just wind open the throttle. Amazing! 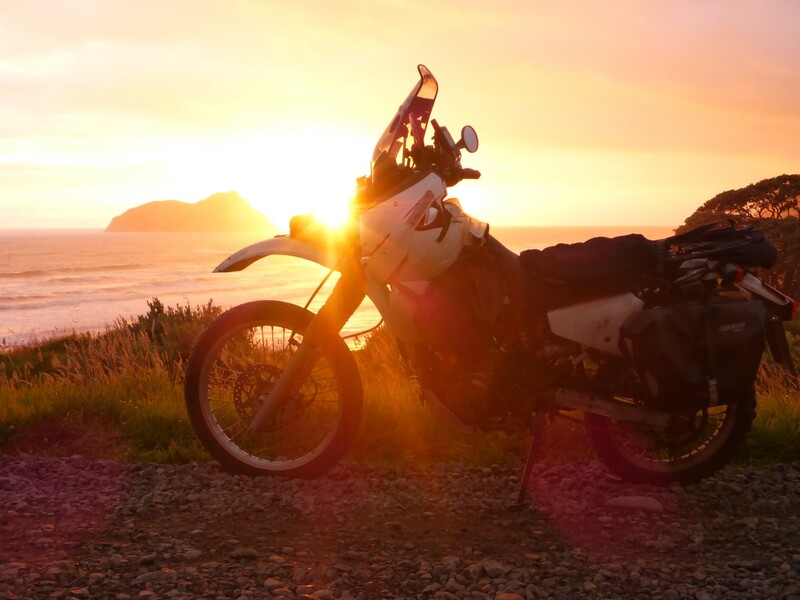 Next day I headed back to Auckland but by a slightly different route.I wanted to ride down the west coast and visit a couple of sites so I headed off into the hills and valleys. 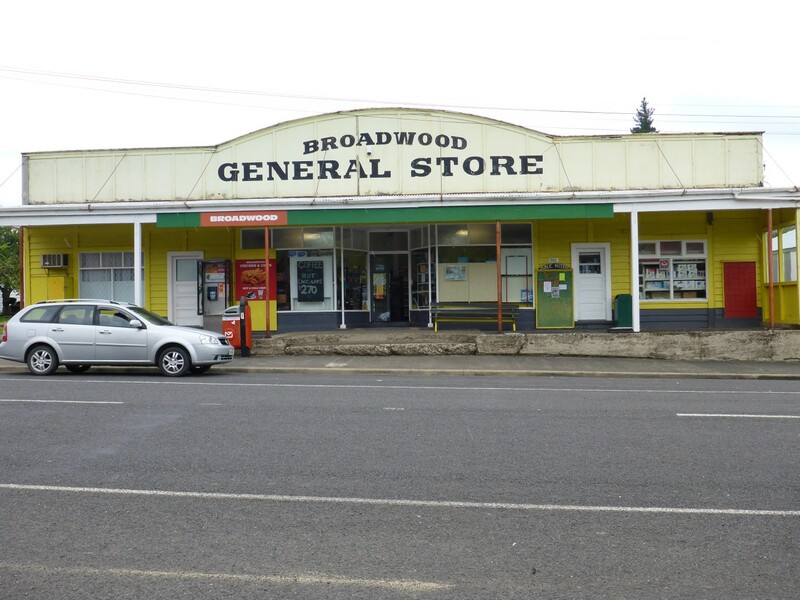 This was my first look at rural New Zealand and I found it very different and yet quite familiar. Nice, twisty roads. Well surfaced with little traffic. The countryside was of rolling hills with sheep and cattle on them. Farmhouses looked to me more like holiday chalets than the images of solid stone edifices the word normally conjures up. They seemed to reflect the wealth of the owner in their size, condition and surrounding land. I’d already realised that brick built houses weren’t common. No surprise when there is a plentiful supply of wood, far more earthquake resistant than brick or stone. I learned over time that many houses are wood or steel framed with a variety of claddings to suit the owner’s taste and budget. I like a nice little ferry. Further on I came to a ferry across a river, which I got onto just as the gates were closing. The guy operating it noticed the Wales sticker I’d stuck on my mudguard, given to me by my Welsh biker friend Gareth. He told me he was of Welsh origin which, may be why he refused to take the $5 dollar fare from me, offered to him as I rode off the boat. We Welsh stick together, bejaysus! I was entranced by some of the small towns and villages I rode through too. They had an air of timelessness about them, with their veranda fronted shops and wooden structures. They looked more like American small towns than anything else, often having diagonal parking spaces outside them, along wide main streets. Quaint looking village general store. 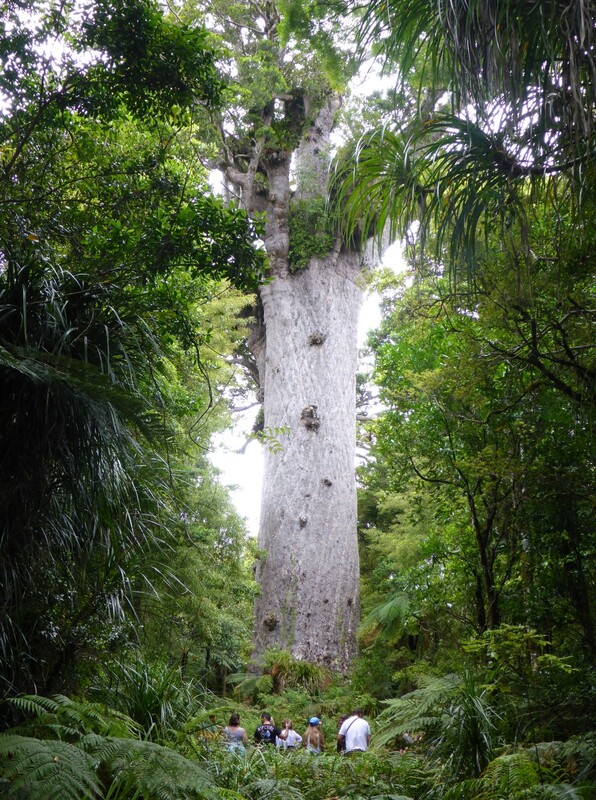 One of the things I wanted to see was the Giant Kauri Tree, situated in the Waipoua Forest. One of the last remaining native primeval forests, it contains many trees and plants that thrive in the combination of warmth and relative wetness, not found elsewhere in NZ. This tree, named Tane Mahuta by the Maoris, is anything between 1,250 and 2,500 years old, has a trunk girth of about 14 metres and an overall height of about 52 metres. All I know is I got a crick in my neck when trying to see the top. It’s big! There are many other large Kauri trees nearby and the wetness of the forest shows in the amount of giant ferns and wet moss that hangs off everything. In typical NZ style, access to the tree was via a wheelchair friendly walkway, well signposted and with approximate walking times on display. As time went by on my journey I found these times to be very pessimistic and I guessed they were based on a one legged man walking backwards – or something. Still, it was good to have the information. Further on I stopped at a viewpoint overlooking one of the early European settlements, founded by missionaries. Not at all uncommon in the early days of settlement. 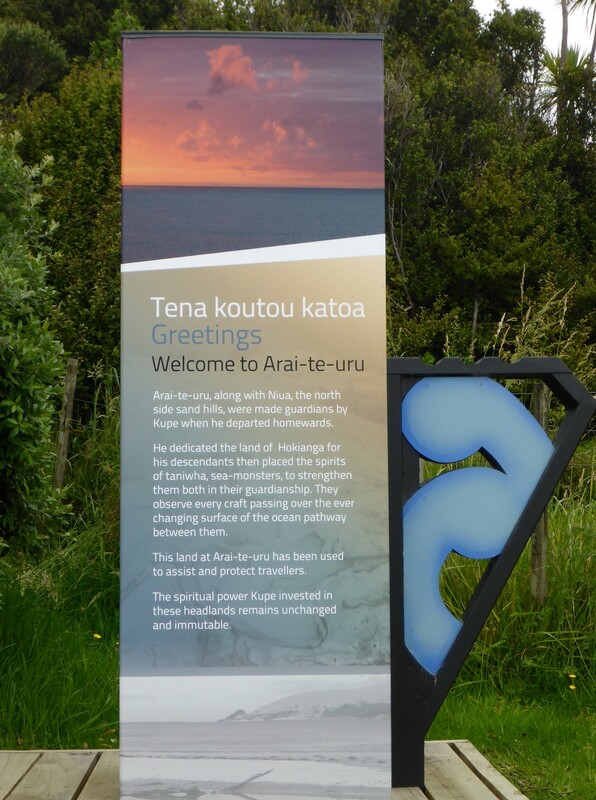 The information board also gave information about some of the Maori beliefs and customs prevalent in this area at the time. 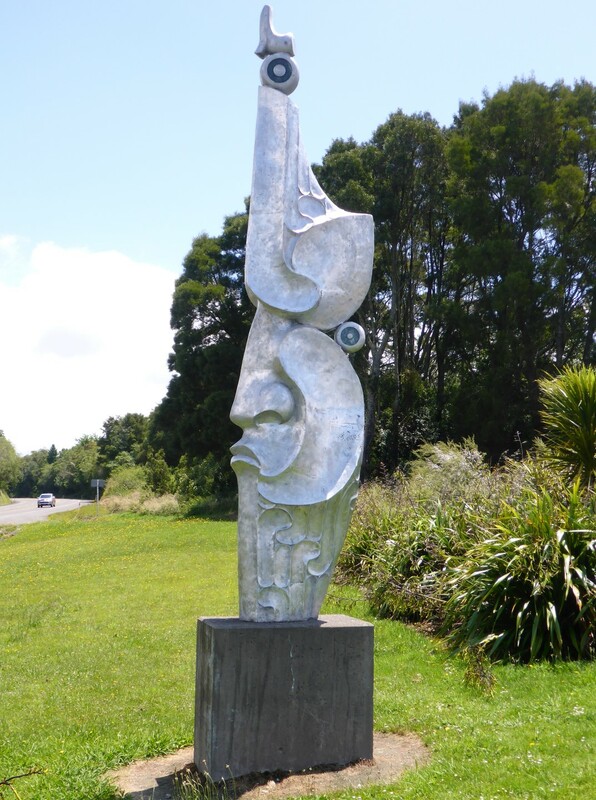 Some information on local Maori beliefs. Back in Auckland I settled in to a hostel and enjoyed a conversation with one of my roomies, a young Canadian woman. She was taking a year out after finishing her degree in mechanical engineering and before joining the airforce, where she hoped to fly helicopters. She rides a Suzuki GS500 so we had a nice biker style chat, all about slow winter riding and fast summer bends. Those unexpected moments are one of the great things about hostel life. 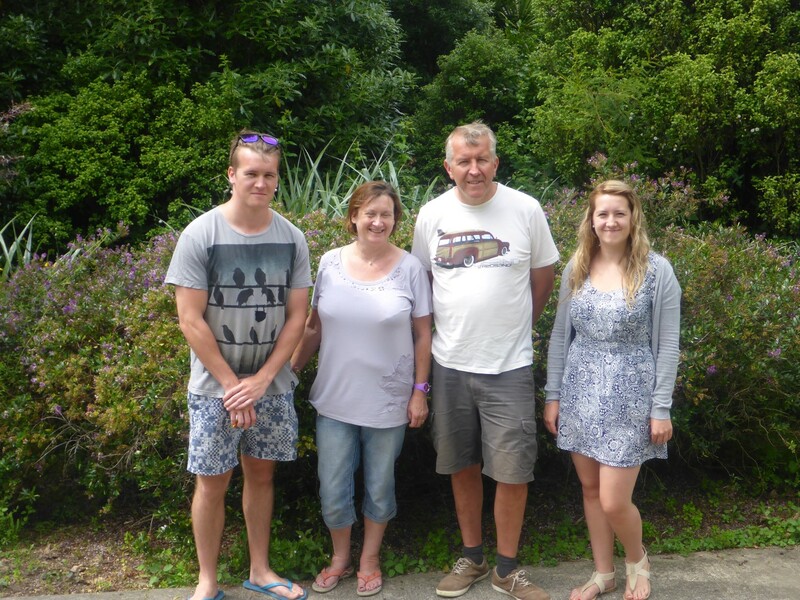 It was now Christmas Eve so I headed south to Rotorua where I’d been invited to stay with some English friends. They’d been in NZ over seven years and had made a great success of their life here. Jeff was with the City of London police and is now a detective. Cate continues her work as a district nurse. Their two kids, twenty three and twenty two years old, have taken to the NZ lifestyle very easily and have done very well regarding education and work. Jeff said that immigrants tend to reach a ‘hump’ about two years in, where the newness has worn off and missing home increases. He and Cate reckon that provided they can get through that period, then new arrivals will be OK thereafter. That makes sense to me and I would think it applies to any migrant in any country. At least with NZ there’s no new language to learn. Jeff, Cate and family. Thanks for a great Christmas guys! Rotorua isn’t an expensive place to buy property and Jeff and Cate have a very nice house on an acre of land. Enough room to keep a few sheep and lambs. 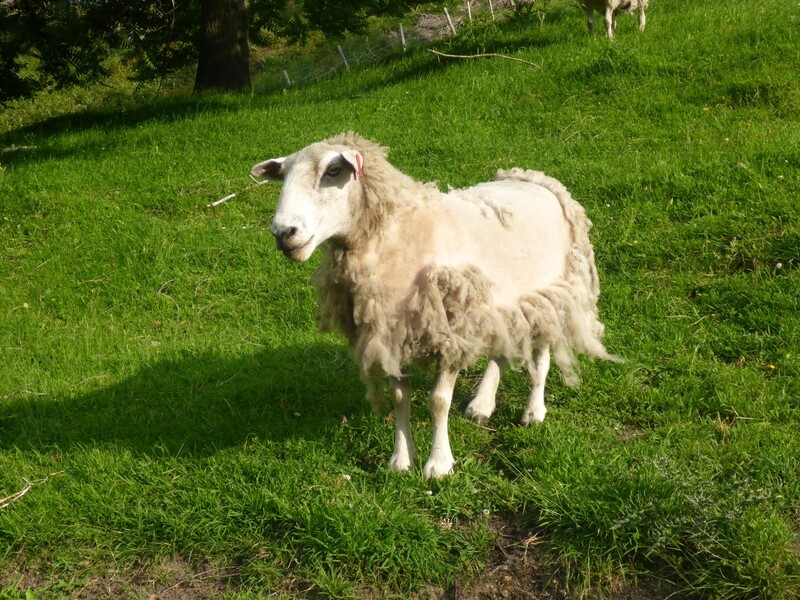 Fresh roast lamb and sheep to keep the grass short – in a word, idyllic! I had a great Christmas there, my first away from my family, and I’m very grateful to them for their hospitality. They even bought me a small present so that I would,’t feel left out on Christmas morning. Dinner was a large cooked ham rather than turkey, which tends not to fit in with the seasons here. On Boxing day we went to visit some English friends of theirs who have a boat. So we went down to one of the local lakes and had great fun ‘biscuiting’ (see photo) and relaxing in one of the thermally heated pools at the water’s edge. Biscuiting. The aim is to get the occupant of the rubber ring in the water. I was soon wet! Several parcels had arrived there for me, replacement gear for what was damaged on the Expressway in Japan, along with some things I’d asked to be sent from home. So I spent a happy few days, post Christmas, fitting new luggage etc, and sorting out this and that, ready for the next section of the trip. 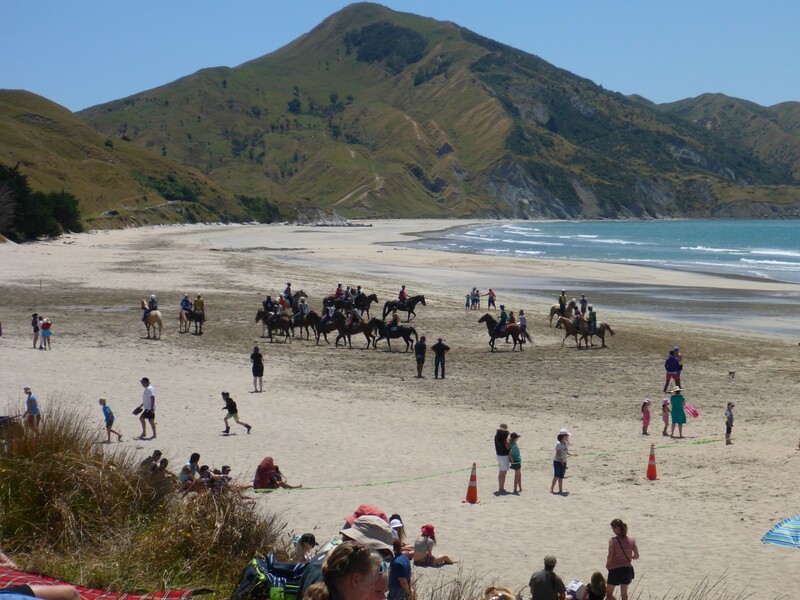 I had a ride planned that would take me out to the East Cape, where I was going to spend New Year. I also helped Jeff with a couple of jobs around the garden, which he’d been saving up for his days off. I took them all out for a meal one evening too, trying to repay their hospitality as much as I could. Jeff had put me in touch with Patterson’s Motorcycles, a local bike shop, and I’d been able to use their workshop to service Doris. I’d also ordered a couple of small parts at the local Suzuki dealer. One thing that was troubling me slightly was that the engine was getting a bit noisy. It sounded like valve gear or timing chain to me, although the people at the bike shop said it might be from the piston. Worrying, and something to keep an eye on. Supplier of lamb chops? No, family pet now at Jeff and Cate’s. 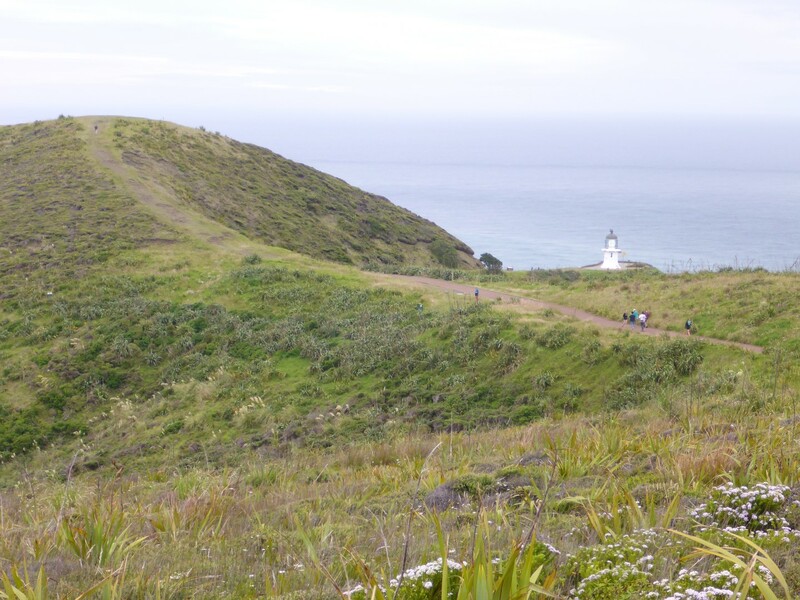 The East Cape Lighthouse lies at NZ’s easternmost point and is at the end of a twenty kilometre gravel track. I’d already spent a night in a good campsite after leaving Jeff and Cate, so wasn’t too troubled when I found the one out on the cape had facilities that were limited to a field, a tap and a long drop toilet – a hole in the ground with a shed around it. None of that mattered as I had plans to commune with nature. I was next to the sea, it was summer and it was new year’s eve. So for the first time in my adult life I went to bed at 10pm and didn’t see in the new year. Instead I got up at 5am, rode down to the lighthouse and watched the first sunrise of 2015 spread itself across the sea in front of me. There were probably about twenty others there with me and we were the first in the Southern Hemisphere to see the first dawn of the new year. The new year dawns, out at East Cape lighthouse. Doris gets in on the act. At 178.5 degrees east the lighthouse is as close as we could get to the new dawn short of taking a trip out to a small island in the middle of the Pacific Ocean. A magical moment and far more enjoyable than singing Auld Lang Syne, at a party I wasn’t enjoying very much anyway, was ever likely to be. And then the day got even better. I was chatting to a young couple on the campsite, Jason and his Japanese girlfriend Natomi, when the owner, a Maori named Len, came round and invited everyone on the campsite to a Hungi on his nearby farm. 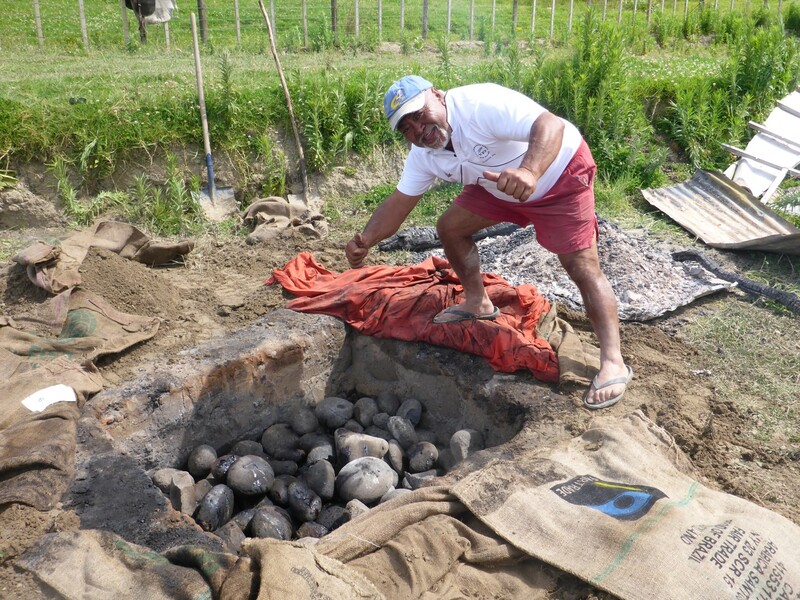 A Hungi is a traditional Maori meal, more of a feast really, where the food is steam cooked in a pit. Larval rocks are heated up, placed in the bottom of the put and then cuts of various meats are wrapped in tin foil and placed in wire baskets. These are wrapped in wet cloth and placed on top of the rocks. The pit is filled with earth and everything steam cooks over several hours. Len opens up the cooking pit. Jason had been telling something of Maori culture, having worked as a consellor among Maori prisoners in NZ jails. He also showed me how to do a Hongi, which is the traditional Maori greeting among men. It involves grasping the other guy’s right hand, your left hand goes on his shoulder and you touch your nose and forehead against his, holding that position for a few seconds. During this time you will breathe each other’s breath meaning that you have exchanged the spirits of your ancestors. Now, you are far less likely to fight each other. Len Walker and his family were such nice people that I couldn’t imagine wanting to fight them anyway. 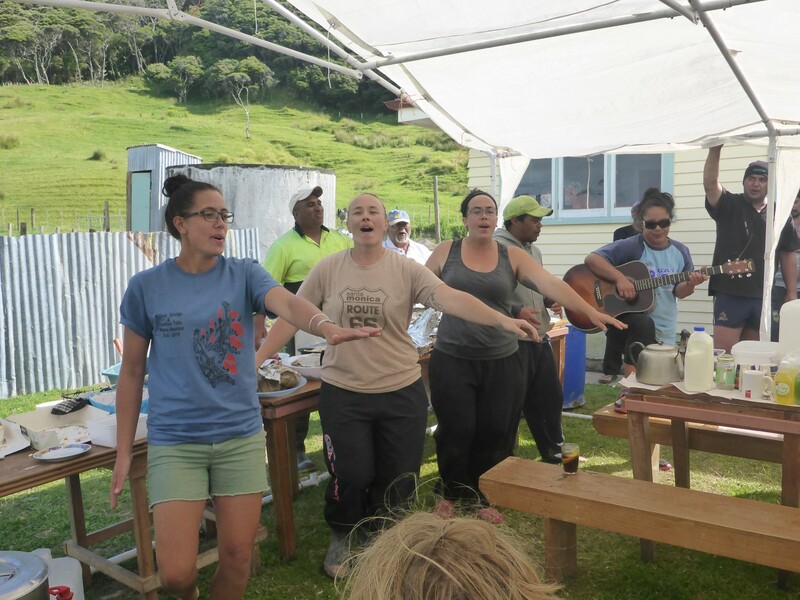 Even so, they appreciated being greeted in the Maori style when we got to the farm. We watched the meat being dug out of the cooking pit, along with the sweet potato and other root vegetables that had been in there too. The food was as delicious, and as tender as you’d expect it to be, and we had a great time chatting with all of Len’s relatives and children. His kids live in Australia, common among the Maori it seems, and he tended to see them and his grandchildren about every five years. During this visit he was trying to persuade them to support his vision of using some of his farm buildings as holiday accommodation for home stay visitors. 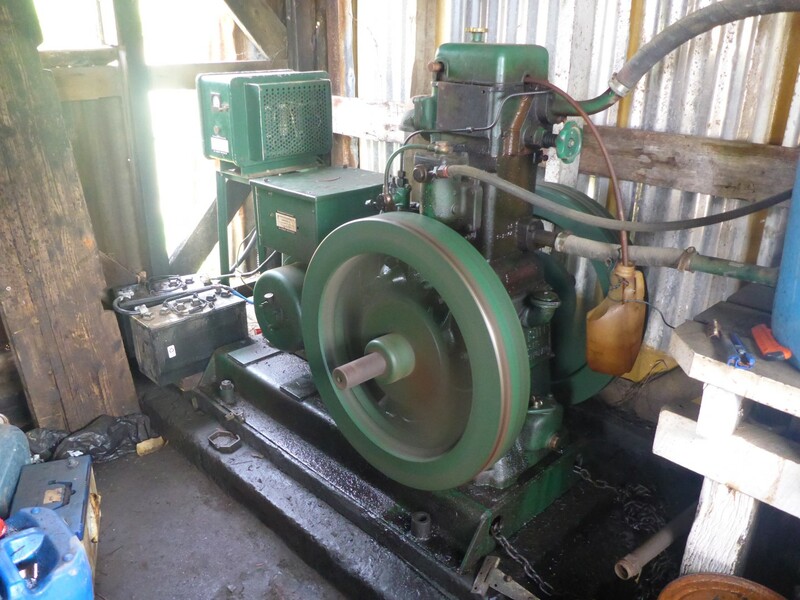 A fascinating sight for me was his diesel powered generator, still chuntering away at fifty years old. Many Maori own such farms and are a key part of NZ’s population and its economic success. How does a man of Polynesian origin get to have a surname like Walker? Inter marriage is the reason. It seems that the earliest white visitors, who were mostly Sealers and Whalers, took Maori women as wives and slowly the practice spread, with mixed marriages becoming very common. Len told me he could claim to be either Maori or Scottish. I can safely say he looked nothing like a pale faced Celt! It’s reckoned that there’s no such thing as a pure blooded Maori left now, although I don’t know how true that actually is. However the culture is still strong. A song from the women to welcome the guests. The exact date of the earliest Polynesian emigration to Aotearoa (New Zealand) is uncertain but it was during the late 13th C. They had been gradually populating the more southern Pacific islands and eventually reached NZ’s south island. They survived off the land, finding NZ’s large population of flightless birds and plentiful seals an easy source of food. They had also brought with them a kind of sweet potato called Kumara as well as a breed of pig to supply meat. Fish and shellfish were plentiful too. By about 1500 they were settling in the north island and their numbers were growing. They developed a warlike tendency, and fought for land and resources. One of their most precious resources was Greenstone, a kind of Jade, which is only found in the south island. They used this to make tools and weapons. Pakeha (White Europeans) began to arrive around 1780 to hunt seals and whales. This was the beginning of the European takeover of New Zealand. Maoris helped crew some of the ships, intermarried with some of the men and small settlements were formed. As the years went by missionaries arrived, successfully converting many Maoris to this European religion. They were happy to trade food and materials for muskets but less happy to find themselves dying from European diseases. From a peak of possibly 100,000 around 1800, the Maori population declined to less than 40,000 at the time of the 1871 census. In modern times the population is back to were it was. As more Europeans arrived there were conflicts taking place between different groups of Maoris and between Maoris and Pakeha. The settlers asked the British government to intervene and eventually the Treaty of Waitangi was signed between the British government and over 500 Maori chiefs. Essentially it meant that they became British subjects, and retained property rights in return for accepting British sovereignty. The treaty was extended to the south island too, just in time to prevent some French settlers from claiming the island for France. It was a close run thing. One of the problems with this treaty was that of interpretation and it took the next hundred years to resolve many of the problems it created. Some are still ongoing. However, the Maori were the first native population in any British colony to be given voting rights and they had four seats in the new parliament. There were a number of conflicts, some violent, between Maori and Pakeha but as time went by the two peoples became more integrated. Maori were recognised as owners of the land and were able to sell it to settlers. Their culture nearly disappeared during the early part of the 20th C, and they obviously suffered racism, but it has been revived and is now thriving. Some of the disputes about land rights are still being resolved. Unfortunately there is an element of criminality and gang warfare among small numbers of city based Maori, mostly related to the drugs trade. Jason told me that his work as a counsellor led him to believe that it was a loss of contact with their tribal roots that was partly to blame, along with a certain amount of deprivation and poor education. 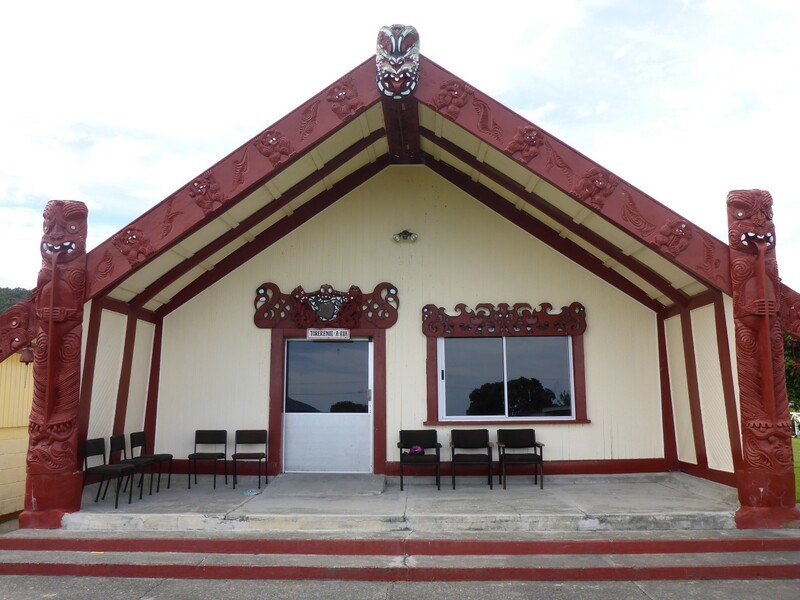 Wharenui, a Maori communal meeting house. 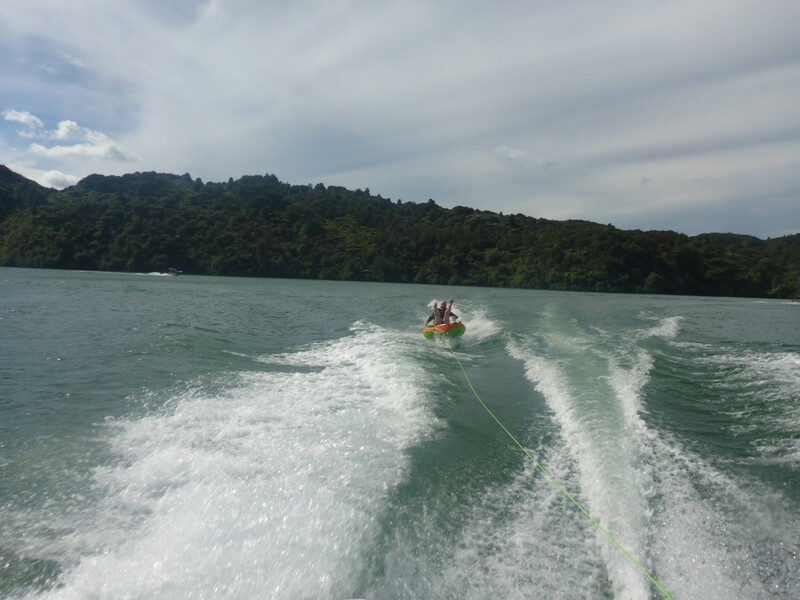 For my part I had really enjoyed my first taste of Maori culture but it was time to move on. I headed further down the east coast to Gisbourne. 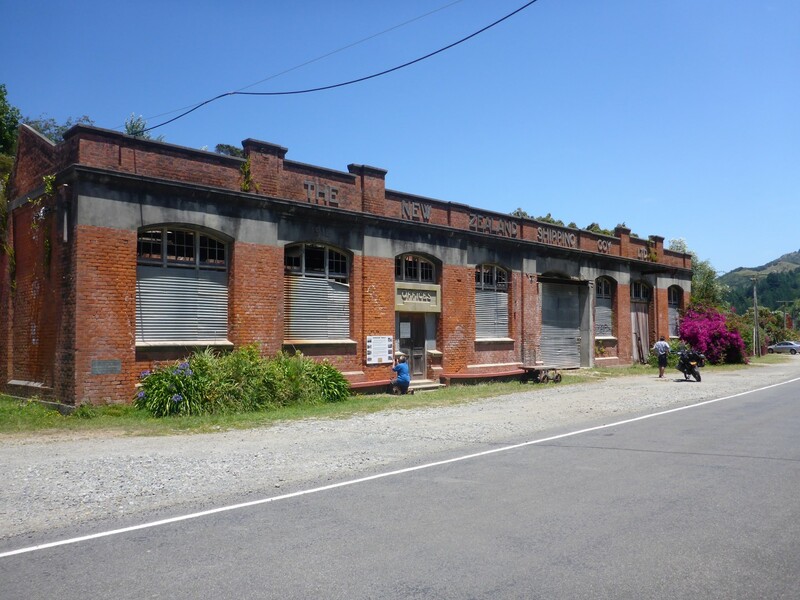 En route, I called in to Toko Maru bay to see the old freezer works and wool store, and to Talaga Bay to check out the longest wharf in the southern hemisphere, at 600 metres. Both of these places told the story of the development of this young country. Settlers became farmers but NZ had no internal road network. These places were built at the beginning of the 20th C. Animals and produce were brought to the coast by truck on local roads. The slaughtered meat was loaded into the new freezer ships and produce such as flax and wool into cargo ships. The long wharf made the loading process much faster and more efficient. Previously ships relied on surf boats to ferry the goods from the land to their safe anchor points, an operation fraught with danger and unreliability, especially in bad weather. From there the goods were taken to other ports in NZ but more often to their export markets in Australia and Europe. 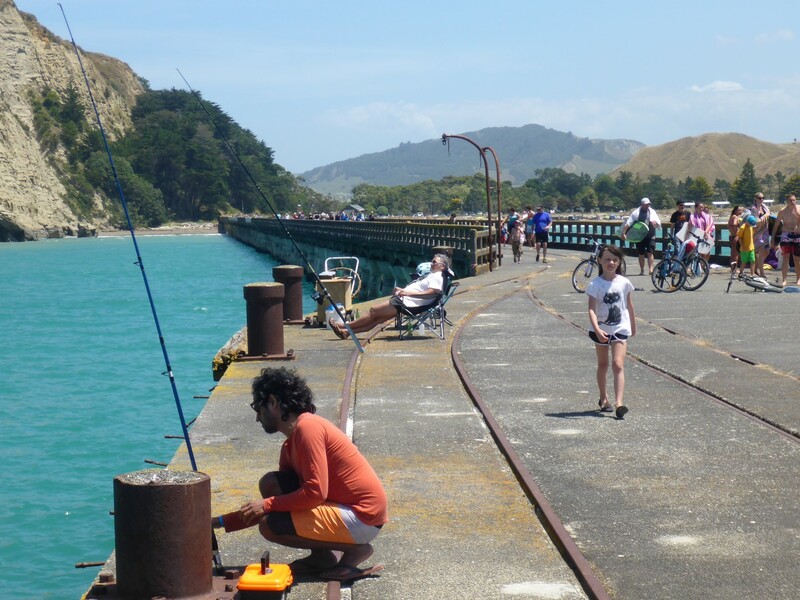 As time went by the NZ government extended the road network and by the 1950’s these facilities were no longer needed once the faster and cheaper trucks could do the work of the coastal ships. Such is progress and it was an interesting lesson on how newly settled countries are developed. As I rode beside the coast I could easily see why the area is popular with holiday makers. There were many campsites along the beautiful coastline, many of them ‘free camps’, but the living units had to have their own toilet facilities with them. No good to a tent living biker then. Fortunately I was able to find hostel accommodation via the i-Site in Geraldine and booked in for four nights. It’s a nice town and the CBD had several shops that I’d seen elsewhere, but the majority were clearly local businesses – a good thing to see. The streets were nicely laid out and were well kept and decorated with flowers etc. Most shops had verandas at the front, something that was appreciated in the warm sunshine. Park and Sell Corner. Not uncommon in NZ towns. While riding down the coast I’d seen signs for Talaga Bay Beach Races, taking place on the Sunday of the post new year weekend. I decided to go to see what it was all about. But I was going to be cautious during my return visit. I’d had a run in with the police as I left the town the first time – a bit too rapidly for their liking. Fortunately I got away with a telling off although the policeman reckoned he had the power to transfer a speeding charge to the UK. Gulp! 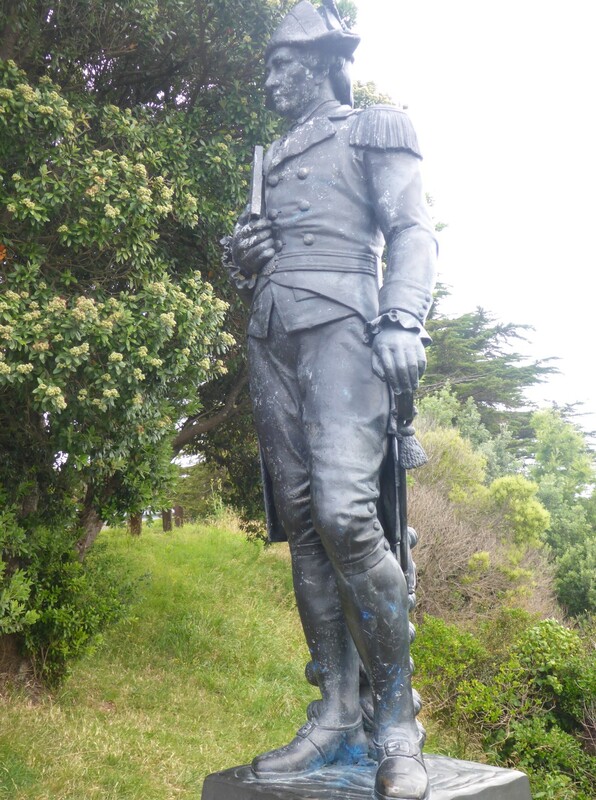 I went for a walk up the hill near the town and found the famous statue of James Cook that looks nothing like him. A local brewery owner bought it from Australia and had it erected but historians told him it looked nothing like the man and even the uniform on it wasn’t British. Egg on face for him. Where it comes from or who it is nobody knows. While we’re on the subject it’s time to clear up a very common misunderstanding. Captain Cook never visited New Zealand, or Australia. At the time of these voyages he was a Lieutenant. He became a captain much later. And his ship was not named HMS Endeavour. It was HM Bark Endeavour. HMS Endeavour already existed at the time he named his ship. A Bark (from the French, Barque) has three masts but with less sail than a full rigged ship, so could operate with a smaller crew. So now you know! The view across Poverty Bay was excellent and away in the distance I could see Young Nick’s Head, a series of cliffs named after Cook’s cabin boy. There was an observatory up there too, the most easterly in the southern hemisphere. 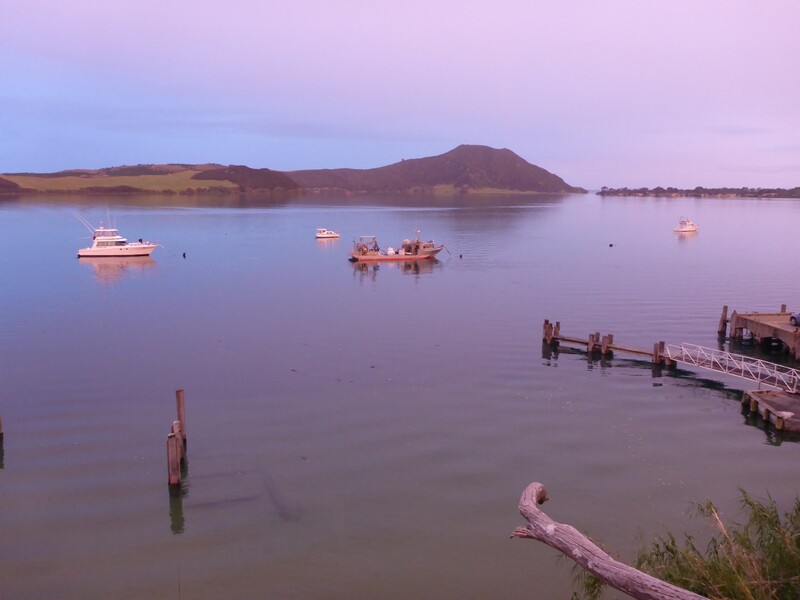 The bay was Cook’s first landing point in NZ. He gave it that name because the hostility of the local Maoris prevented him from getting the supplies he needed. 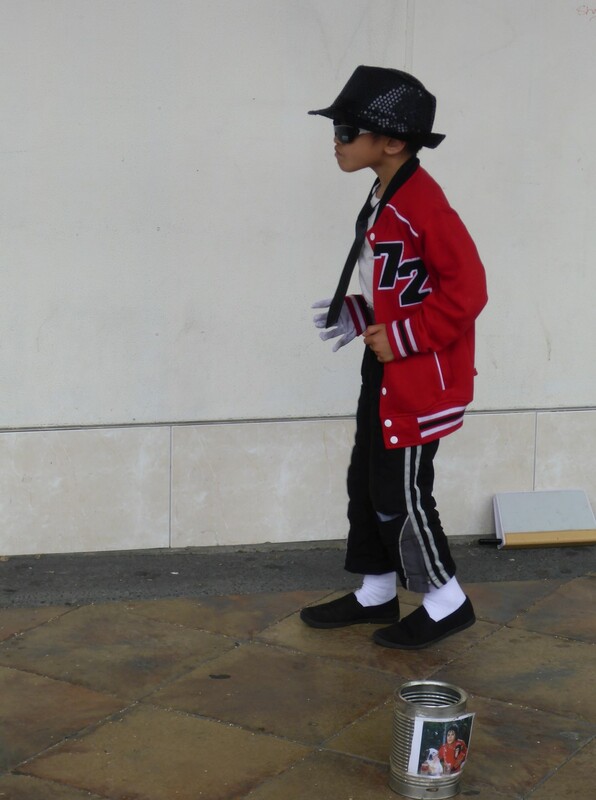 A young street entertainer treats us to his Michael Jackson routine in Gisbourne. Sunday arrived so I headed (carefully) back through Talaga Bay and out to the beach where the racing was taking place. This is a very popular annual event, evidenced by how busy it was. 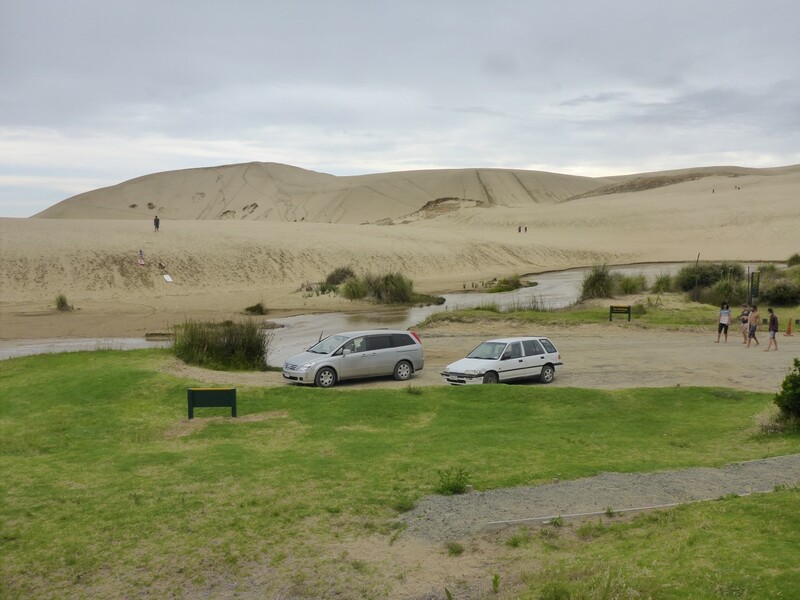 I tucked my bike into a corner of the car park and walked over the dune to find a place to sit. I’d missed the first couple of races but I still enjoyed watching the runners and riders beating a path along the beach. A strictly amateur affair, aimed at local people, farmers and other horse owners. Betting was allowed but only on one race at a time and the stake was fixed at $5. It was closer to a sweep stake really, you got whichever horse was next on the list. I lost, of course. The horses warm up before their race. 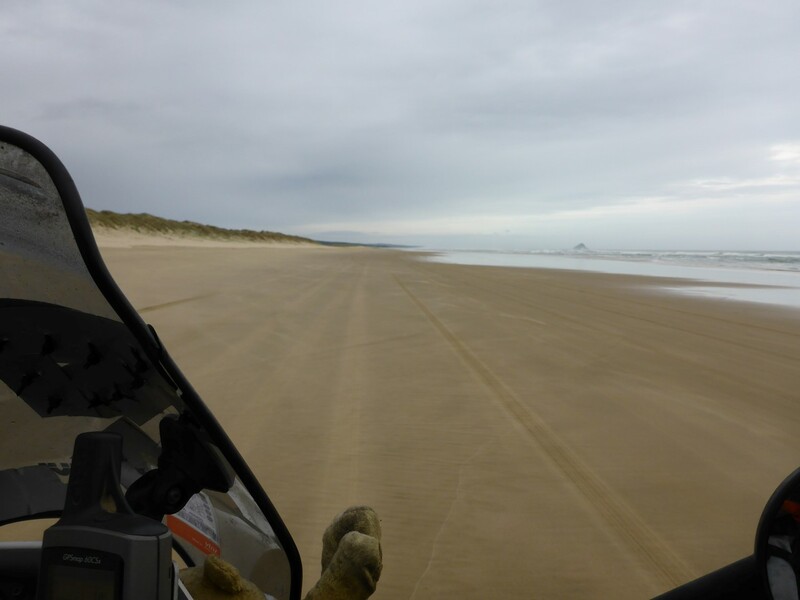 The racing was fun to watch, with a course that was laid out between the sea and the dunes, that was about 300 metres in length. It was great to see so many families enjoying the spectacle and the sunshine. All the profits go to local good causes within the town area, a very nice bit of localism. I eventually left Gisbourne with a plan. My road atlas shows the gravel tracks and I had found one that would take me back to Rotorua via Lake Waikaremoana in the Urwera National Park. This is one of the north island’s prettiest lakes and there is a tramping trail around it, reckoned to be one of NZ’s nine ‘Great Walks’. Denoted as State Highway 38, the road included about 100kms of gravel and I was keen to test my skills (and luck). It was a beautiful day and the deep blue lake, as I slid and skidded round it, looked fantastic. After the gravel came a really nice bend swinging road so the whole day was full of fun and challenges. 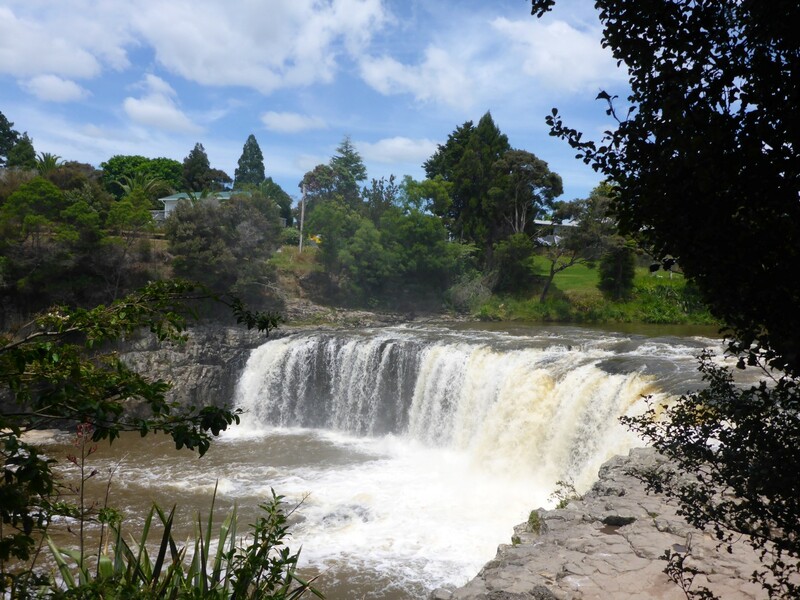 By the time I reached Rotorua once more my biking appetite was sated and I was happy to settle in to a town centre hostel, full of friendly youngsters. 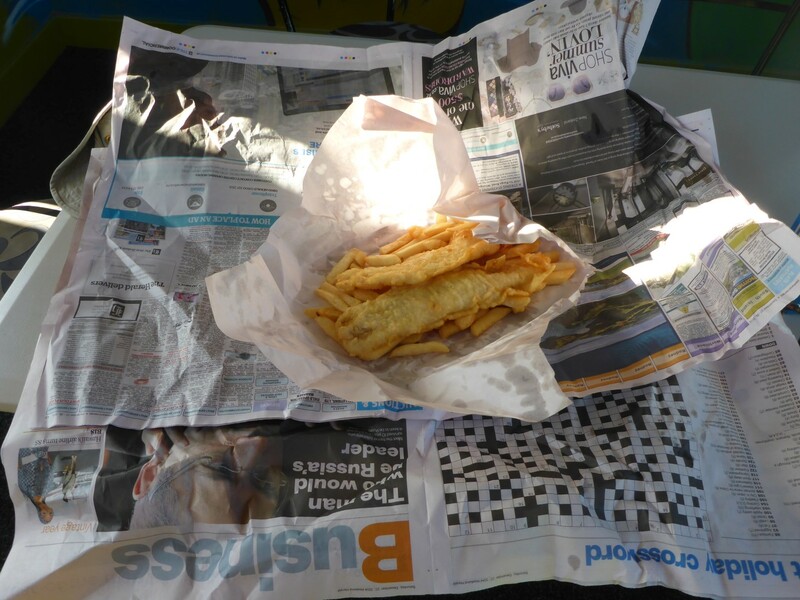 Nearby was a fish and chip shop where I received my traditional style evening meal wrapped up the traditional way – in newspaper. Fantastic! I hadn’t really had a chance to look round Rotorua while I’d been staying with Jeff and Cate so I spent the next few days exploring. The main feature of this town is the hot sulphur pools that can be found almost everywhere. 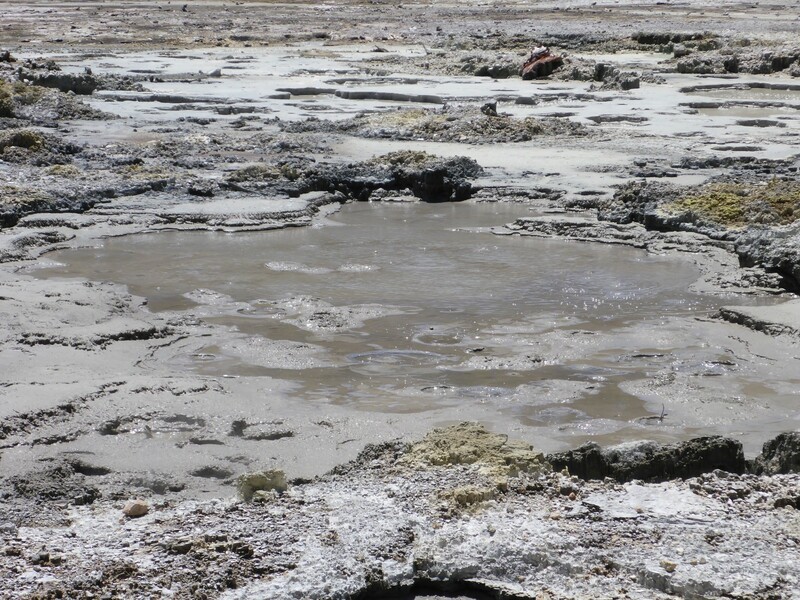 It sits on a very active thermal area and it’s common to see steaming mud pools alongside the road. Until a volcanic eruption destroyed them in 1886, the town was famed for its terraces of pink and white coloured sulphur rock, which attracted many visitors who wanted to cure all their ills by sitting in the water. 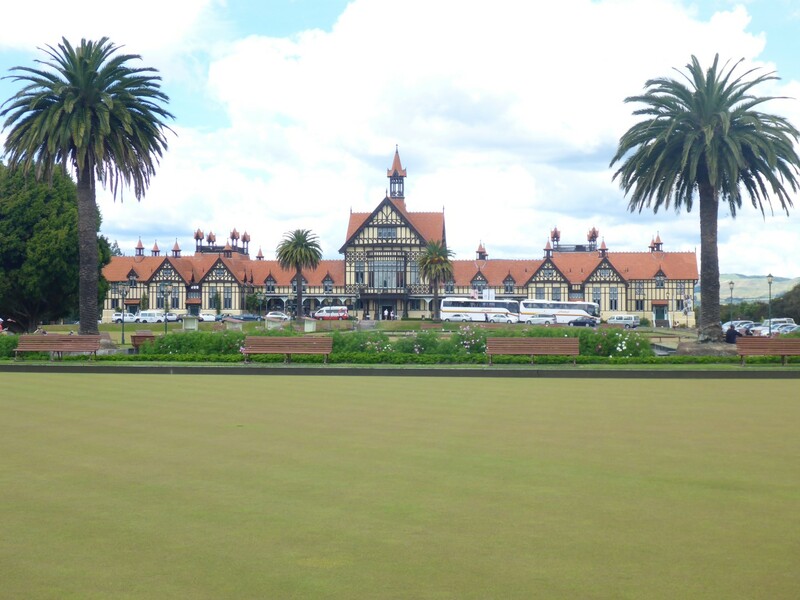 Rotorua Spa building, now a museum. At the beginning of the 20th C the new Ministry of Tourism decided to invest in the area and provided funds for the Great South Sea Spa. 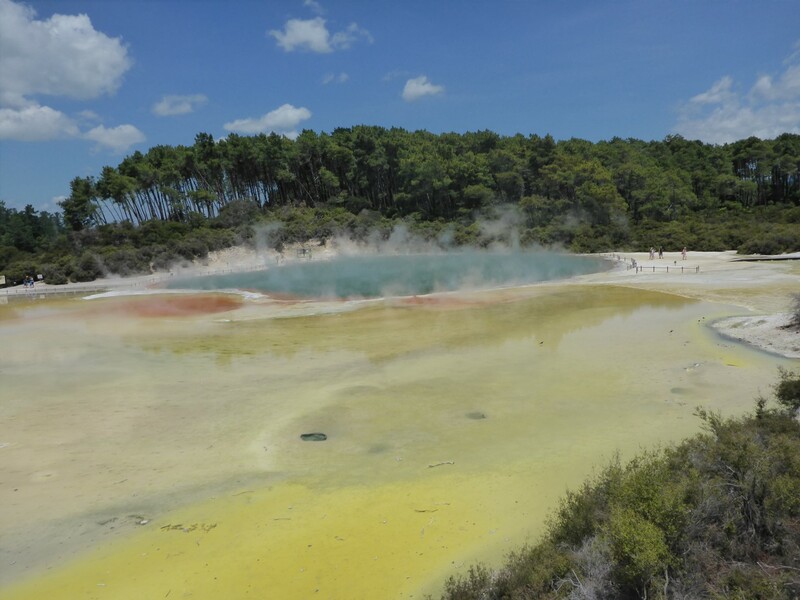 Rotorua is special in that it has both acid and alkaline waters, along with the boiling mud. They hoped to attract people from around the world to this far flung corner of the southern ocean. 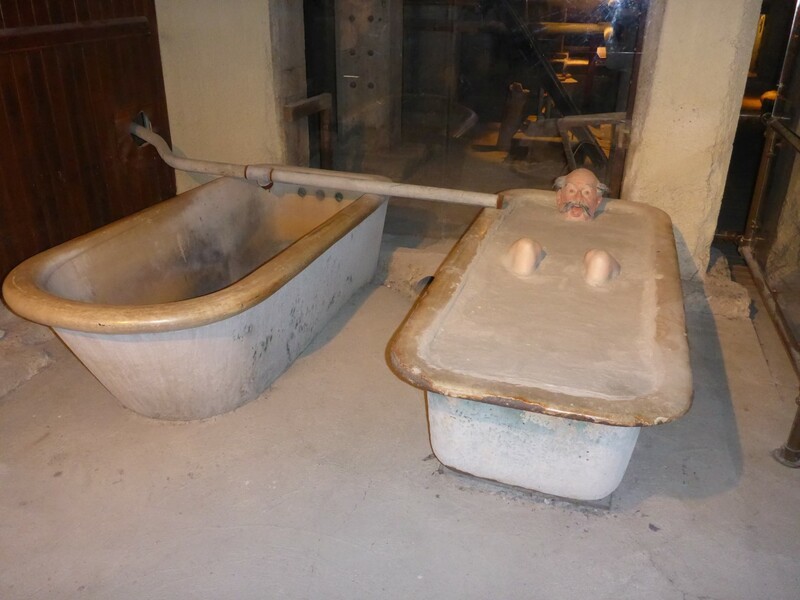 Although popular, the spa was never the international success hoped for and failed to attract the rich northern tourists that the NZ government hoped it would. The building itself was plagued with problems. The sulphuric acid rotted the pipes and the steam left black condensation marks all over the walls and ceilings while rotting them at the same time. Maintenance costs were very high. It was used as a recovery centre for WW1 & 2 troops. Hot mud bath. Good for the constitution. and our Irish guide told us the stories related to the building and the area. I spent an afternoon there and also the next morning. 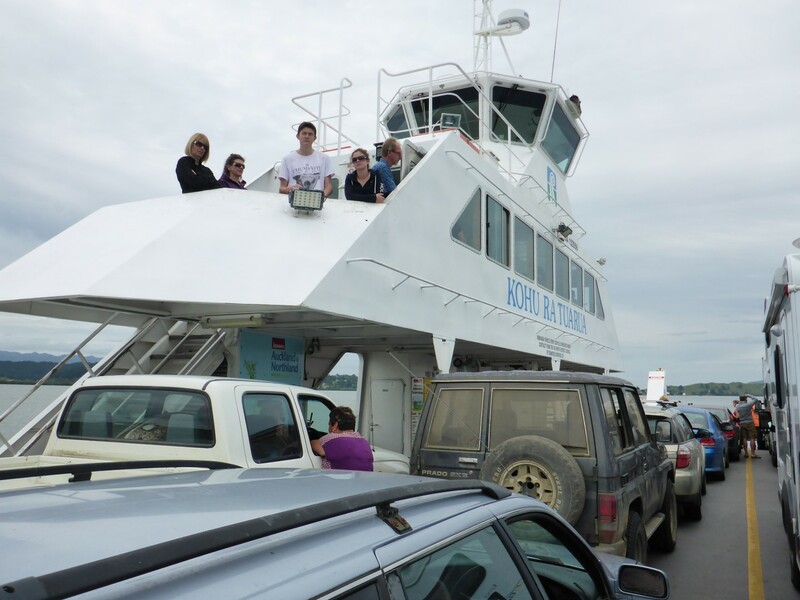 The ticket I bought enabled me to go back next morning to finish my tour – an excellent idea. 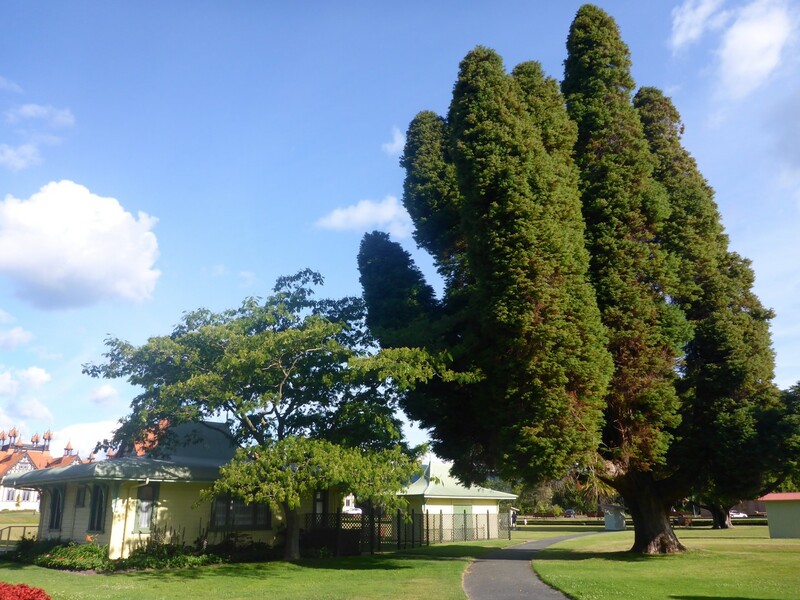 Old park buildings and native rees. It is surrounded by Government Gardens, which has several old buildings such as the bandstand, and clubhouses for bowls and cricket. Built around the beginning of the 20th C, these look great and fit right in with the main Spa building and the fabulous looking native trees. 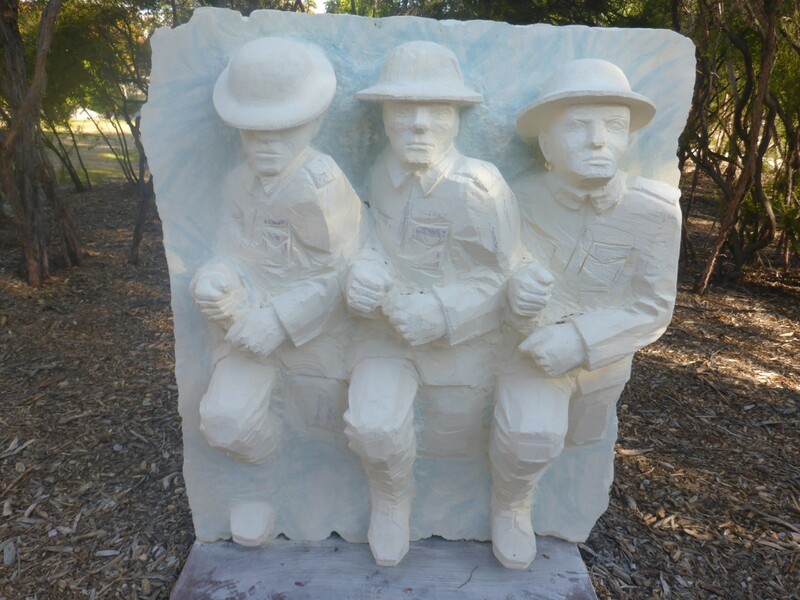 There are also some thermal pools to wonder at and there is currently an exhibition of sculpture dedicated to the WW1 centenary. 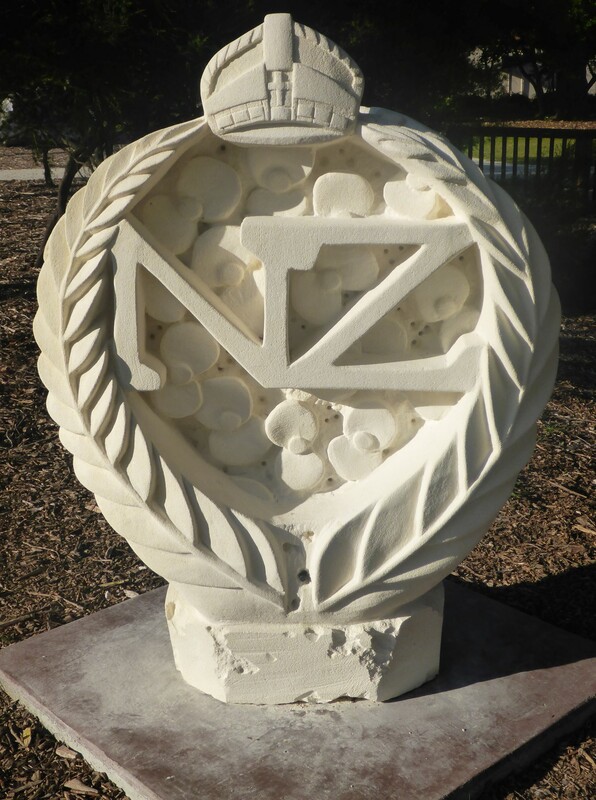 Dedicated to NZ’s WW1 troops. As well as being a tourist I also organised the purchase of a couple of items I needed for the bike and upped my worry level a notch as the engine was definitely getting noisier. I went back to Pattersons and spoke to Mark, the service manager. He agreed it was noisier than before and reckoned it could be the piston. I also got the mechanic at the Suzuki dealer to listen to it and he definitely thought it was the piston. I wasn’t convinced. For a start it wasn’t using any oil. The noise sounded to me like a very slack cam chain and it was fairly quiet while I was riding along, but becoming noisy at tick over. What to do? Neither shop in Rotorua could look at it for over a week. 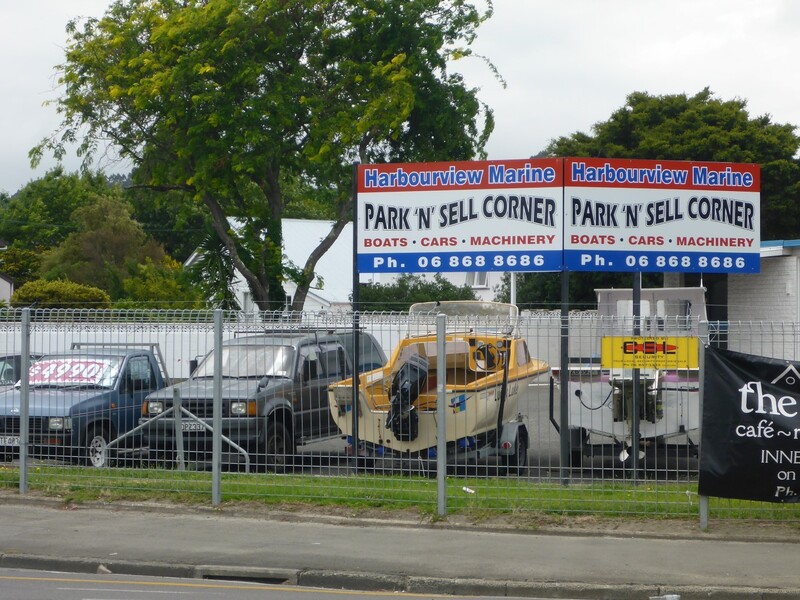 In the end I booked it into Red Barons, a Suzuki dealer in Wellington, for Wednesday next week. I was convinced it would be OK until I got there. I didn’t want to start pulling it apart myself just in case it was the piston. I just didn’t have the tools to do a job like that, especially not in the back yard of a hostel. I did decide to do some basic checks however, and adjusted the valve clearances and checked the function of the cam chain tensioner. All was OK. While at the Suzuki dealer I’d chatted to a Kiwi rider who used to work on a pig farm in Wales. His brother lives in Aus so he put me in touch with him. Another friendly face to visit when I get there. All this was going on while I was trying to locate an electrical fault. I’d come out of the shop and when I tried to start the bike – nothing! The fuse had blown so I stripped out various parts of the electrics and eventually the fault went away. I still don’t know what it was or how I cured it. I’m hoping it was just a mysterious short circuit that is now fixed, otherwise I know it’s going to come back to haunt me someday. So, decision made, I left Rotorua to head for Napier, a town further down the coast. 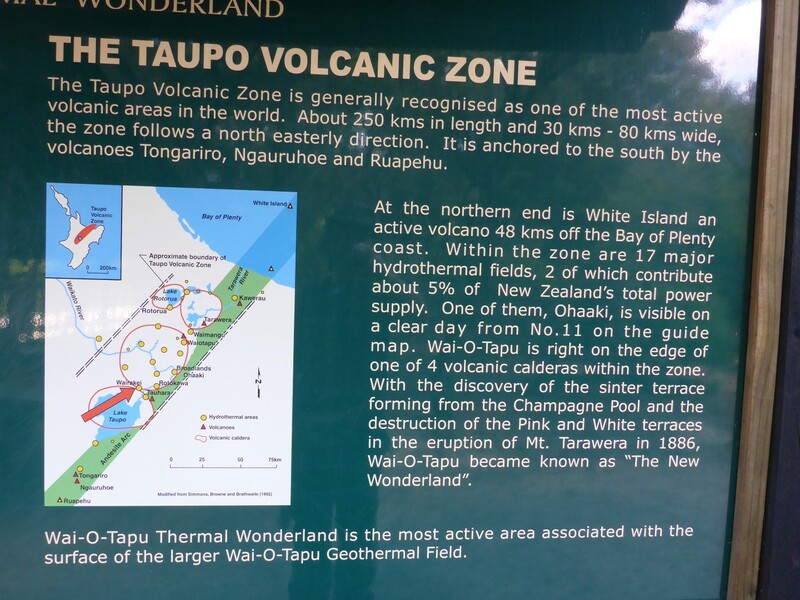 On the way I visited Wai-O-Tapu Thermal Wonderland. And it lives up to its name. There is a huge area of thermal pools, all with different colours of rock and water. There are caves, waterfalls and steaming mud holes too. They have made carefully laid out walkways so that visitors could see and smell all the different natural sights. Apart from them there seemed to have been no human interference. I was impressed, both with the natural wonders and their presentation. I was learning that Kiwi’s were very proud of their natural heritage and did their best to present it as unspoiled as possible. Where all the heat comes from. Napier awaited. Destroyed by nature and rebuilt by man, there was definitely a story to discover there. Cheers Paul, glad you enjoy them. Thanks Daryl, very pleased that you’re enjoying it. As ever, I’m impressed with your excellent story-telling – truly first class writing!